As Demokratizatsiya turns 25, we are marking the occasion with a blockbuster issue on post-Soviet elections. We asked Sofie Bedford and Ryhor Nizhnikau, the special editors of this issue, a few questions about what readers can expect and the implications of the authors’ findings for policymakers. DEM: The 25th anniversary issue of Demokratizatsiya is an exciting one. Can you give us an overview of what readers have to look forward to? Sofie and Ryhor: It sure is! We are very glad to be a part of it. 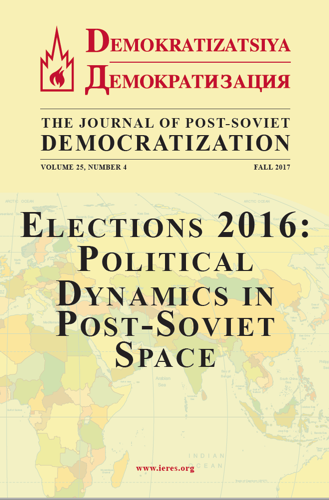 This issue looks at the wave of national elections which took place in the post-Soviet space during the fall of 2016. The articles focus on parliamentary elections in Belarus, Russia and Georgia, the presidential campaign in Moldova, and the referendum in Azerbaijan, as well as campaigns in Transnistria and Central Asia. The issue discusses elections as not merely a tool of regime change, but also as an instrument for studying a wide variety of issues – especially those on which we lack data, like the state of society, the resources of the regime and the opposition and the impact of their interactions. DEM: What inspired you to put together the special issue? Sofie: I am in charge of the academic journal Baltic World’s “election coverage,” where we publish online commentaries on elections taking place across a vast area covering Central and Eastern Europe, the Caucasus, Central Asia, and the Balkans and the wider Baltic Sea region. So you can say that elections were already on my mind when it dawned on us that the occurrence of a number of almost simultaneous elections in the post-Soviet region was a great opportunity to discuss what the similarities and differences in their character, function and meaning could tell us about the varying state of political development in the respective countries. DEM: How did you come up with the impressive range of perspectives represented? Sofie and Ryhor: We tried to put together authors with diverse empirical interests, methods and approaches from different research perspectives that still fit our overall idea. We succeeded, but at the end of the day we are just truly indebted to our great contributors. Their impressive knowledge of their topics exceeded even our expectations and we are very glad to have been able to get them on board. DEM: As we were editing these texts, one thing that really stood out to us was the observation – in Bidzina Lebanidze and Kornely Kakachia’s text on the recent Georgian elections – that Bidzina Ivanishvili’s personal wealth amounted to 46% of Georgia’s GDP in 2012. Was there anything that particularly surprised you or seemed particularly relevant, whether in your own research or in the issue as a whole? Ryhor: It is a spectacular fact indeed. When it comes to the post-Soviet space, sometimes you come across facts that today even for area specialists look a bit surreal and you may feel like Alice in Wonderland. Therefore, when we see something mundane or “normal,” that is quite unusual to us. Sofie: As my own research during the last few years has been focused on “opposition” in Azerbaijan and Belarus, I found Semenov’s study both interesting and important. There is a tendency to see the relation between government and opposition in authoritarian states as a zero-sum game. As long as the “opposition” does not manage to “oust” the government and establish “democracy,” it is generally seen as “unsuccessful.” This is not a constructive approach and it does not further our knowledge of what “opposition” means in authoritarian contexts and its function there. Andrei’s article is a great contribution to the field. On the one hand, he acknowledges the marginalization of opposition in Russia’s regions; on the other, he shows that despite the obstacles, sometimes the opposition managed to gain some ground or even defeat the incumbent. I like it because it problematizes the idea of a totally “failed” opposition without giving the illusion that a “democratic miracle” is bound to happen any time soon. DEM: Here at Demokratizatsiya, we are particularly interested in the policy relevance of the articles we publish. What would you say are the key takeaways from this body of research for policymakers? Sofie and Ryhor: Many theoretical discussions of the 2000s about the democracy promotion, market reforms and the efficiency of conditionality, which still guide decision-makers, are no longer relevant and are misleading and counterproductive. We now see new forms and functions of the post-Soviet regimes and they will stay in that form for quite a while. DEM: Now that this issue has been published, what’s next for you? Sofie: I will contribute to a project striving to better understand the security situation in the South Caucasus by investigating the “mindsets” of key actors in these societies. My focus will be on Azerbaijan, particularly on the securitization of religion and elite perceptions of neighboring states. At the same time, I am planning a book project to present the really interesting findings from our research project “Building Sustainable Opposition in Electoral Authoritarian States” that is near its end. Ryhor: I will be mostly focusing on the experience of the Ukrainian reforms after the Euromaidan. Sofie and Ryhor: We are extremely grateful to the editors and really appreciate the opportunity to contribute to the journal. And big congratulations on the anniversary! It is a tremendous achievement and we are now looking forward to the next big celebration. Sofie Bedford is currently a visiting fellow at the Institute for Human Sciences (IWM) in Vienna, Austria and a researcher at the Institute for Russian and Eurasian Studies (IRES) at Uppsala University, Sweden. Contact: sofie.bedford@ires.uu.se. Ryhor Nizhnikau is a senior researcher at theFinnish Institute of International Affairs, Helsinki. Contact:ryhor.nizhnikau@fiia.fi. To read the issue, click here. If you don’t have access to Demokratizatsiya, why not subscribe? If you enjoyed this article, or have a question you’d like us to ask future authors, please let us know! Email Editor Robert Orttung and Deputy Editor Ellen Powell at demjournal@gwu.edu or fill in the contact form on the home page.